NKT cells are enigmatic lymphocytes that respond to glycolipid Ags presented by CD1d. Although they are key immunoregulatory cells, with a critical role in immunity to cancer, infection, and autoimmune diseases, little is known about how they respond to antigenic challenge. Current theories suggest that NKT cells die within hours of stimulation, implying that their direct impact on the immune system derives from the initial cytokine burst released before their death. Here we show that NKT cell disappearance results from TCR down-regulation rather than apoptosis, and that they expand to many times their normal number in peripheral tissues within 2–3 days of stimulation, before contracting to normal numbers over subsequent days. This expansion is associated with ongoing cytokine production, biased toward a Th1 (IFN-γ+ IL-4−) phenotype, in contrast to their initial Th0 (IFN-γ+IL-4+) phenotype. This study provides critical new insight into how NKT cells can have such a major impact on immune responses, lasting many days beyond the initial stimulation of these cells. Natural killer T cells are a specialized T cell lineage with unique functional characteristics that distinguish them from conventional T lymphocytes. NKT cells have been characterized as cells that coexpress the NK cell marker NK1.1 and the TCR, although most of them have a semi-invariant TCR, consisting of an invariant TCR Vα14Jα18 chain (Vα24Jα15 in humans) and a TCR β-chain that is heavily biased toward Vβ8.2 (Vβ11 in humans), Vβ2, and Vβ7 (1, 2, 3). In contrast to conventional T cells that recognize peptide Ags in conjunction with MHC molecules, these NKT cells with a semi-invariant TCR recognize glycolipid Ags in conjunction with the MHC class I-like molecule, CD1d (4, 5, 6, 7). NKT cells are known to play a key role in a range of different diseases, including autoimmune diseases, cancer, and infection (1, 2, 8, 9). One of the most striking characteristics of NKT cells is their ability to secrete high levels of immunoregulatory cytokines, including both IFN-γ and IL-4, within minutes to hours of Ag encounter (1, 2, 3). Indeed, this is thought to be the primary means by which they regulate immune responses. This has also presented a paradox to immunologists, as some of these cytokines, such as IFN-γ and IL-4, work in opposition to each other. Furthermore, the types of responses ascribed to NKT cells range from immunosuppression to immunoaggression (9, 10). Related to this, in some cases NKT cells seem to steer the overall immune response in a Th2 direction, characterized by the secretion of IL-4 and IL-13. In other cases, however, they seem to push the response in the opposite, Th1 direction, in which IFN-γ is the predominant cytokine. The problem of how NKT cells can regulate such a diversity of responses is compounded by studies suggesting that NKT cells die though apoptosis within a few hours of TCR stimulation via activation-induced cell death (AICD) 3 (11, 12, 13, 14, 15, 16). Most studies of NKT cell activation have employed the glycolipid α-galactosylceramide (α-GalCer). This compound, originally derived from marine sponges, binds CD1d, forming a complex that binds the NKT cell TCR with high affinity, leading to potent NKT cell stimulation (5, 7, 17, 18). In vivo injection of α-GalCer into mice causes a rapid burst of cytokine production within 1 h of treatment, and within a few hours, NKT cells in spleen and liver are virtually undetectable (11, 12, 13, 14, 16, 19). This is believed to represent AICD, and in one study was suggested to be Fas dependent (13), although this mechanism was not supported in two separate studies (11, 14). Similar NKT cell disappearance has been reported in vivo when NKT cells are stimulated by anti-CD3 or IL-12 (15). Perhaps the most surprising consequence of NKT cell stimulation is the subsequent recurrence of NKT cells, usually within 2–3 days of stimulation (11, 12, 15, 20). This is thought to be thymus independent, primarily arising though NKT cell expansion in bone marrow (15). In contrast, in vitro stimulation of NKT cells does not lead to rapid death, but instead results in the proliferation of these cells and the down-regulation of NK1.1 from the cell surface (21). In this study we carefully monitor the fate of α-GalCer-stimulated NKT cells in vivo, using CD1d/α-GalCer tetramer as well as NK1.1 expression to identify these cells from the first hours after stimulation through 12 days. Our results suggest that receptor down-regulation is a primary cause of NKT cell disappearance following α-GalCer treatment. Furthermore, we show that NKT cells undergo rapid expansion and sustained IFN-γ, but not IL-4, production for several days after stimulation. Inbred C57BL/6 wild-type (WT) mice were purchased from The Walter and Eliza Hall Institute of Medical Research (Melbourne, Australia) or The Alfred Medical Research and Education Precinct Animal Facility. The following gene-targeted mice were bred and maintained at The Peter MacCallum Cancer Institute: C57BL/6 perforin-deficient (from Dr. Karupiah, The John Curtin School of Medical Research (Canberra, Australia) and derived from C57BL/6 ES cells); C57BL/6 gld (gld; FasL mutant; breeding colonies obtained from The Jackson Laboratory (Bar Harbor, ME)), and C57BL/6 TNF−/− (TNF−/−) (22) and C57BL/6 TNF−/− gld (TNF−/− gld) mice (23) (obtained from the Centenary Institute of Cancer Medicine and Cell Biology (Sydney, Australia)). Bim−/− mice were obtained from Dr. P. Bouillet (The Walter and Eliza Hall Institute). Mice, 6–14 wk of age (usually 6–9 wk), were used in all experiments; the experiements were performed according to animal experimental ethics committee guidelines. To avoid nonspecific binding of Abs to FcRγ, cells were preincubated with anti-mouse CD16/32 (2.4G2) mAb (grown in-house) before staining with FITC- or allophycocyanin-conjugated anti-αβTCR (clone H57-597); PE- or biotin-conjugated anti-NK1.1 (clone PK-136); FITC- or PerCP-conjugated CD4 (clone RM4-5); FITC-, biotin-, or allophycocyanin-conjugated Mac-1 (clone M1/70); PE-conjugated mouse IgG2aκ isotype control (clone G155-178); FITC-conjugated hamster IgG2λ isotype control (clone Ha4/8); and PE- or CyChrome-labeled α-GalCer-loaded mCD1d tetramers (produced in-house at La Jolla Institute of Allergy and Immunology, La Jolla, CA). Biotinylated Ab were detected with streptavidin, Alexa Fluor488 conjugate (Molecular Probes, Eugene, OR), or streptavidin-PerCP. All flow cytometry reagents were purchased from BD PharMingen (San Diego, CA), unless otherwise indicated. Cells were gated and sorted as previously described (24). After washing twice with PBS, the stained cells were analyzed on a FACSCalibur (BD Biosciences, San Jose, CA), and the data were processed with CellQuest software (BD Biosciences). Cells were washed three times in serum-free annexin V binding buffer, containing 0.01 M HEPES, 0.14 M NaCl, and 2.5 mM CaCl2 in ddH20, before labeling with FITC-conjugated annexin V (BD PharMingen) for 25 min at room temperature in the dark. Cells were washed once in annexin V buffer, and 7AAD (5 μg/ml, final concentration; Molecular Probes) was added 10 min before acquisition. Cells were analyzed using a FACSCalibur (BD Biosciences), and the data were processed with CellQuest software (BD Biosciences). Following isolation from liver and spleen, lymphocytes were labeled with cell surface Abs and washed once in PBS before fixing in 0.5% paraformaldehyde (BDH Chemicals, Poole, U.K.) in the dark for 30 min at room temperature. Cells were washed twice in PBS before incubation with Abs for intracellular staining in PBS containing 0.05% saponin (Sigma-Aldrich, St. Louis, MO) in the dark for 1 h at room temperature. Intracellular staining Abs included FITC-conjugated anti-αβTCR (clone H57-597), hamster IgG2λ (clone Ha4/8), anti-Vβ8 (clone F23.1, a gift from Dr. F. Carbone, University of Melbourne, Melbourne, Australia), or PE-conjugated anti-IFN-γ (clone XMG1.2), IL-4 (clone 11B11), or rat IgG1 as an isotype control (clone R3-34). Lymphocytes analyzed for intracellular cytokine staining were cultured for 2 h in 5 μg/ml brefeldin A (Sigma-Aldrich), without in vitro stimulation, before cell surface labeling. Lymphocytes were isolated from the liver as previously described (24). To avoid nonspecific binding of Abs to FcRγ, cells were preincubated with anti-mouse CD16/32 (2.4G2) mAb (grown in-house) before staining with FITC-conjugated anti-αβTCR (clone H57-597) and PE-conjugated anti-NK1.1 (clone PK-136). All flow cytometry reagents were purchased from BD PharMingen unless otherwise indicated. Cells were gated and purified by sorting as previously described (24). After washing twice with PBS, the stained cells were analyzed on a FACStar Plus (BD Biosciences), and the data were processed with the CellQuest program (BD Biosciences). Mice were given an initial injection of BrdU (1 mg i.p. ; Sigma-Aldrich) and provided sterile drinking water supplemented with 0.8 mg/ml BrdU and 5% (w/v) glucose (Merck, Darmstadt, Germany). BrdU drinking water was made up fresh and was changed every 2 days. For analysis of BrdU uptake by flow cytometry, cells were prepared as previously described (25). Briefly, surface-stained cells were fixed using PBS containing 0.5% paraformaldehyde (BDH Laboratory Supplies) and 0.01% Tween 20 (BDH Laboratory Supplies) overnight. Cells were washed and incubated with 50 Kunitz units of DNase (30 min, 37°C; Roche, Mannheim, Germany) and subsequently stained with FITC-conjugated anti-BrdU mAb (BD Biosciences) containing Tween 20 (0.2%) for 1 h.
FACS-sorted liver NK1.1+αβTCR+ (NKT) cells (purified to >98%) from WT mice were washed three times in serum-free medium before labeling with 1 μM CFSE (Molecular Probes)/107 cells for 10 min at room temperature in the dark. Cells were washed three times in 2% normal mouse serum in PBS before 1–2 × 106 CFSE-labeled NKT cells were adoptively transferred via i.v. injection into recipient WT mice. Twenty hours later, recipient mice received an i.p. injection of either 2 μg of α-GalCer or vehicle, and they were killed 16 h later. Cell suspensions were labeled with anti-NK1.1-PE, anti-αβTCR-allophycocyanin, and annexin V-biotin, followed by streptavidin-PerCP and analyzed for the presence and the phenotype of CFSE+ cells in liver, spleen, lymph nodes, bone marrow, blood, and thymus by flow cytometry using a FACSCalibur (BD Biosciences). Mice that had not been injected with CFSE-labeled cells were included as a control for the presence of rare CFSE+ cells. α-GalCer was provided by Pharmaceutical Research Laboratories (Kirin Brewery, Gumna, Japan) and was prepared in saline supplemented with 0.5% polysorbate-20 (wt/vol). The vehicle control was saline supplemented with 0.5% polysorbate-20 (wt/vol). Mice received a single injection of 2 μg of α-GalCer or control vehicle i.p. In agreement with previous studies, we found that CD1d-restricted NKT cells disappear from the liver (Fig. 1⇓A) and spleen (not shown) within a few hours of treatment. This was supported by both NK1.1 vs αβTCR labeling and also by CD1d/α-GalCer tetramer labeling, which detects all NKT cells with a semi-invariant TCR based upon their Ag specificity. The down-regulation of NK1.1 and αβTCR in response to α-GalCer correlated with the complete disappearance of CD1d/α-GalCer tetramer+ cells (Fig. 1⇓B), indicating that the few remaining NK1.1highαβTCRhigh cells were probably not CD1d dependent, since CD1d/α-GalCer tetramer-reactive cells were not present at this stage. CD1d-independent NK1.1highαβTCRhigh cells are known to exist in WT mice, but their relationship to NKT cells is unknown, and they do not respond to α-GalCer. Similar experiments were performed with a range of genetically deficient strains, lacking various molecules that could mediate lymphocyte cell death, including gld (Fas-L mutant), perforin−/−, TNF−/−, and gld/TNF−/− double-mutant mice. We also tested Bim−/− mice, as Bim is an essential factor in T cell AICD (26). Within 16 h of α-GalCer treatment, NKT cells disappeared from spleen and liver of each strain tested, as shown for gld and Bim−/− (Fig. 1⇓B) and also for perforin−/−, TNF−/−, and gld/TNF−/− mice (data not shown), demonstrating that none of these molecules was critical for the α-GalCer-induced disappearance of NKT cells. Furthermore, we did not detect significantly increased levels of annexin V binding on NKT cells from α-GalCer-challenged mice. As a control for annexin V staining on apoptotic cells, thymocytes were cultured overnight in the absence of stimulation. This resulted in a clearly distinct population of annexin-positive cells (Fig. 1⇓C). Taken together, these results suggest that either NKT cell disappearance involves an unusual form of apoptosis that is independent of the death mediators tested, or cell death is not the primary cause of NKT cell disappearance following α-GalCer stimulation. NKT cells disappear in WT, gld, and Bim-deficient mice. Mice were injected i.p. with 2 μg of α-GalCer and were killed 16 h later for organ removal and flow cytometric analysis of NKT cells. Liver lymphocytes were isolated and labeled with mAbs or CD1d/α-GalCer tetramer. A, NKT cells from WT mice are depicted using either CD1d/α-GalCer tetramer vs αβTCR and NK1.1 vs αβTCR. The arrow indicates NK1.1low αβTCRlow cells. B, The gld and Bim−/− mice were injected i.p. with 2 μg of α-GalCer or vehicle and killed 16 h later; their liver lymphocytes were analyzed for CD1d/α-GalCer tetramer+ NKT cells. C, Liver lymphocytes were isolated from mice injected with 2 μg of α-GalCer i.p. at various time points, stained with mAb, and analyzed by flow cytometry. NK1.1+ αβTCR+ NKT cells were gated on at each time point (i) and analyzed for binding to annexin V as an indicator of apoptotic cells. NKT cells from α-GalCer-treated mice are shown in shaded histograms, and those from vehicle-treated mice are indicated by the dotted line. A sample of thymocytes cultured overnight without stimulation is provided as a positive control for annexin V labeling. The data represent: A: n = 25; B: gld, n = 6; Bim−/−, n = 4; C: n = 2–4 mice/group. A population of cells that were NK1.1low and αβTCRlow was regularly detected following α-GalCer treatment (Fig. 1⇑A, see arrow). This was specific staining, as this population was not detectable using isotype control Abs (not shown), and FcR block was routinely used in all stainings. A similar population of cells was clearly evident in an independent study (11). To investigate the possibility that this population represented NKT cells that might have escaped detection due to down-regulation of surface markers, we monitored NKT cells following α-GalCer treatment in vivo between 1 h and 6 days after treatment (Fig. 2⇓A). Within 2–4 h of α-GalCer treatment, most NK1.1+αβTCR+ cells had started to down-regulate their TCR, with NK1.1 down-regulation occurring between 5 and 8 h. At 16 and 24 h, very few NK1.1+αβTCR+ cells remained, while the population of NK1.1lowαβTCRlow cells remained clearly visible (see arrows in Fig. 1⇑). To directly determine whether NKT cells were down-modulating their TCR, we looked for surface αβTCRlow/intracellular αβTCR+ cells in the livers of α-GalCer-treated mice. As shown in Fig. 2⇓B, intracellular αβTCR+ cells were first detected ∼2 h after treatment and remained detectable until at least 24 h. A separate staining cocktail using anti-Vβ8 Ab revealed a high frequency (>50%) of these cells to be Vβ8+, supporting the idea that these are NKT cells rather than conventional T cells (data not shown). Also, the intracellular αβTCR+ cells progressed from being NK1.1+ at 2 h to NK1.1low by 24 h (data not shown), in line with the delayed down-regulation of NK1.1 as observed in Fig. 2⇓A. Approximately 70% of intracellular αβTCR+ cells were CD4+, which is also typical of liver-derived NKT cells (data not shown). It is relevant that forward light scatter analysis of NKT cells indicated that they became much larger, particularly at 24 h (Fig. 2⇓C), which might have excluded them from detection in some other studies, either through exclusion during density gradient separation of liver lymphocytes or due to them falling outside the normal lymphocyte gate based on forward side scatter of control liver lymphocytes. Although the proportion of NKT cells within the liver lymphocyte population decreased within hours of α-GalCer stimulation, the total number of liver lymphocytes increased over the same time-frame (Fig. 2⇓Di). Thus, the total number of NKT cells, identified as NK1.1+/lowαβTCR+/low cells at 4 and 8 h (see arrows in Fig. 2⇓A) and as intracellular αβTCR+ surface αβTCRlow cells at 16 and 24 h (Fig. 2⇓B), did not significantly change over the first 24 h (Fig. 2⇓Dii). This data strongly suggest that the majority of NKT cells survive α-GalCer stimulation and remain in the liver. NKT cells down-regulate αβTCR and NK1.1 in response to α-GalCer. Mice were injected i.p. with 2 μg of α-GalCer and were killed between 1 h and 6 days later. A, Liver lymphocytes were labeled with mAb and analyzed by flow cytometry. NK1.1 vs αβTCR is shown on viable lymphoid cells, with dead cells excluded on the basis of uptake of 7AAD dye. Lymphocyte gates were applied based on forward vs side light scatter and exclusion of CD11b+ (Mac-1) cells (from 16 h, when these cells were becoming more abundant). B, Liver lymphocytes were analyzed for surface αβTCR vs intracellular αβTCR expression between 2 and 72 h. Hamster IgG2λ was included as an isotype control for intracellular αβTCR staining. C, NKT cells were examined for cell size by forward light scatter analysis. NKT cells from vehicle-treated mice are included as the overlay for comparison. D, Total cell numbers of liver lymphocytes (i) or NKT cells (ii). 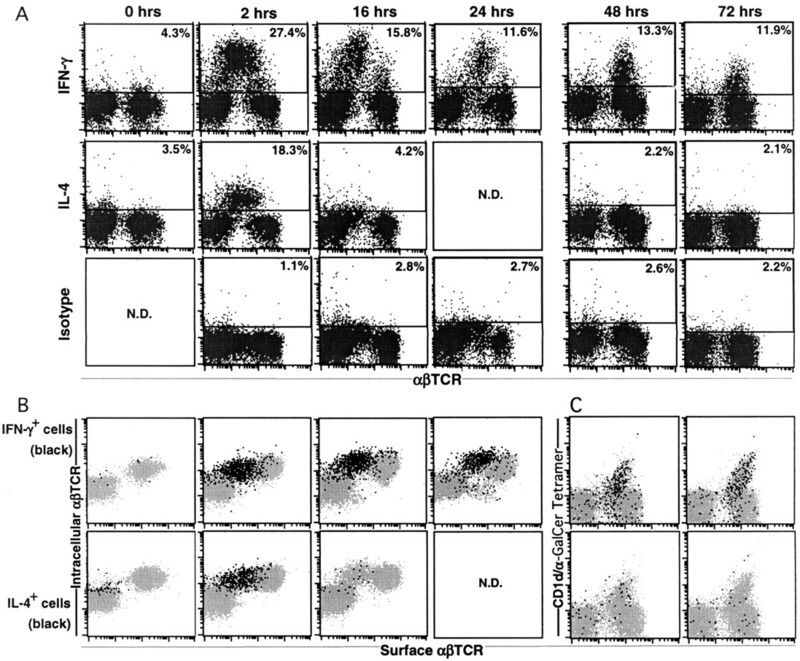 NKT cells were gated as shown (A) or as determined by intracellular TCR staining at 16 and 24 h (B). The data (A-D) represent two to four mice per group. As an additional test of whether α-GalCer-stimulated NKT cells undergo AICD, we wanted to determine the ultimate fate of α-GalCer-stimulated NKT cells in isolation. NKT cells were purified from the livers of WT mice 3 h after the i.p. injection of either α-GalCer or vehicle and were subsequently monitored in vitro for survival and modulation of their surface phenotype. As shown in Fig. 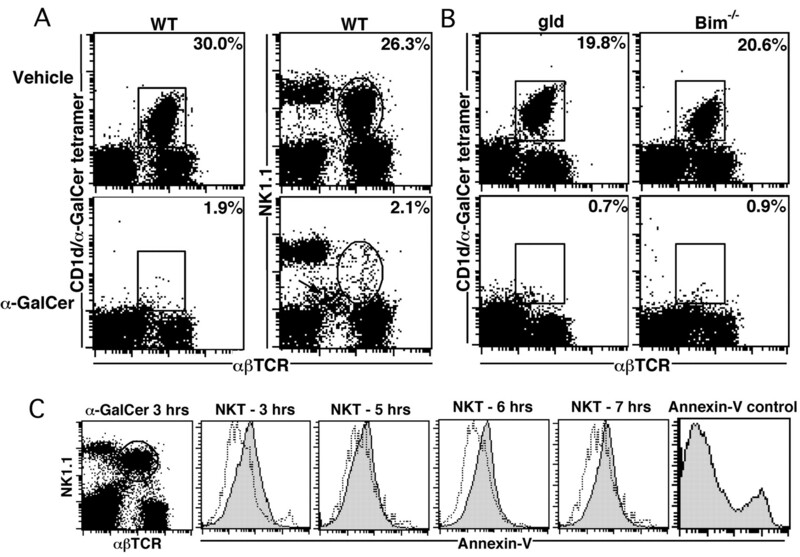 3⇓A, at the time of sorting, the NKT cells had partially down-regulated their TCR, but had not yet down-regulated NK1.1. Twenty-four hours later, at a time when NKT cells are reportedly eliminated, the majority (>75%) of these cells remained viable. We also found that once isolated, the partially down-regulated population re-expressed cell surface αβTCR, but continued to down-regulate NK1.1 at the later time points. NKT cells from vehicle-treated mice retained normal expression of both αβTCR and NK1.1 during the same culture period, although the viability of these cells declined to <50% by 24 h, presumably due to the absence of stimulation and/or survival factors. NKT cells survive α-GalCer in vitro and in vivo. A, Mice were injected i.p. with 2 μg of α-GalCer or vehicle and were killed 3 h later, and their liver NKT cells were purified by flow cytometric sorting based on NK1.1 and αβTCR expression. For α-GalCer-treated mice, FACS sorting gates were set to encompass the partially down-regulated NKT cell population. Purified NKT cells were cultured for 3, 6, 13, and 21 h in culture medium without additional stimulation and were analyzed for NK1.1 and αβTCR expression. The total time since α-GalCer/vehicle treatment is shown in parentheses. B, NK1.1+αβTCR+ cells were FACS sorted from livers of untreated mice, labeled with CFSE, and injected i.v. into recipient mice. Twenty hours later, recipient mice received an i.p. injection of 2 μg of α-GalCer or vehicle. Mice were killed 16 h after α-GalCer or vehicle treatment, and their organs were analyzed by flow cytometry for the presence of CFSE-labeled NKT cells. The total number of CFSE+ (NKT) cells in each group is shown. CFSE+ (NKT) cells in the liver were analyzed for NK1.1, αβTCR, and annexin V binding. The data are representative of three similar experiments with one mouse per treatment per experiment. To identify NKT cells independently of cell surface markers, NKT cells were purified from livers of donor mice by FACS sorting, labeled with the fluorescent dye CFSE, and transferred into recipient mice. Recipient mice were subsequently injected (20 h later) with either α-GalCer or vehicle, and 16 h after treatment, their organs (liver, spleen, thymus, bone marrow, lymph node, and blood) were analyzed for the presence of CFSE+ (NKT) cells (Fig. 3⇑B). In all recipients, most CFSE+ cells were found in liver. Similar numbers of CFSE+ cells were found in both α-GalCer- and vehicle-treated mouse livers, and while most CFSE+ cells in vehicle-treated mice still expressed both NK1.1 and αβTCR, CFSE+ cells in α-GalCer-treated mice no longer expressed these receptors. Furthermore, these cells did not show increased binding with the early apoptosis marker annexin V. This strongly supports our contention that most NKT cells are not depleted within hours of TCR stimulation, but escape detection through receptor down-regulation. Previous studies have shown that NKT cells return to normal proportions within 2–3 days of α-GalCer treatment (11, 12, 20). However, these studies relied on NK1.1 vs αβTCR to identify NKT cells, which may compromise this interpretation, given our data showing that NKT cells down-regulate NK1.1 upon stimulation. Therefore, we used CD1d tetramer to identify NKT cells in a range of tissues for several days after α-GalCer treatment (Fig. 4⇓). This revealed that the percentage of CD1d tetramer+ NKT cells not only returned to normal within 24–48 h, but in some tissues, such as spleen (Fig. 4⇓, A and B) and bone marrow (Fig. 4⇓B), the proportion of these cells had increased ∼5-fold by 2–3 days after α-GalCer treatment. When taken into consideration with absolute cell numbers per tissue (Fig. 4⇓B), which were also increased at this stage in spleen and liver, we found ∼10-fold expansion of NKT cell numbers in spleen, 7-fold in liver, and 3-fold in bone marrow. In agreement with earlier studies, thymic NKT cells did not undergo similar expansion, although these cells had apparently encountered α-GalCer, as indicated by their increased in size at 2–3 days (not shown). An important distinction that might explain discrepancies between this and previous data is that the NK1.1 molecule remained at lower levels for several days following stimulation (Fig. 4⇓B), which would have yielded much lower counts when using NK1.1 vs αβTCR expression to measure NKT cells. CD4 expression did not change over the time course in any tissue (data not shown), remaining at ∼70%. This suggests that CD4+ and CD4−CD8− NKT cells respond similarly to α-GalCer stimulation. This α-GalCer-induced expansion was confirmed to be primarily due to NKT cell proliferation, as demonstrated by BrdU uptake compared with vehicle-treated mice (Fig. 4⇓B). Not all NKT cells were found to be BrdU+, which may mean that some NKT cells were not proliferating or may simply reflect the inability of spasmodic BrdU uptake (depending on the consumption of drinking water) to label 100% of divided cells. NKT cells proliferate and expand after α-GalCer stimulation in vivo. Groups of mice were injected i.p. with 2 μg of α-GalCer or vehicle. They were killed 1, 2, 3, 6, 9, or 12 days later and analyzed for the presence of CD1d/α-GalCer tetramer+ αβTCR+ NKT cells in thymus, spleen, liver, and bone marrow. Some mice were also treated with BrdU, killed 3 and 6 days after α-GalCer injection, and analyzed for BrdU uptake by CD1d/α-GalCer tetramer+ NKT cells. A, CD1d/α-GalCer tetramer vs αβTCR labeling on splenic lymphocytes. B, Graphs depict data derived from tissues examined at each time point. From left to right: total lymphocyte number, CD1d/α-GalCer tetramer+αβTCR+ NKT cell percentage, CD1d/α-GalCer tetramer+αβTCR+ NKT cell number, proportion of NKT cells that were NK1.1+, and proportion of NKT cells that were BrdU+ in vehicle- and α-GalCer-treated mice. The data represent: vehicle, n = 3; day 1, n = 2; day 2, n = 2; day 3, n = 3; day 6, n = 3; day 9, n = 3; and day 12, n = 3 mice/group. In light of our data showing that NKT cells survive and proliferate in response to α-GalCer treatment, an important question was whether they were still producing cytokines while their TCRs were down-regulated, and whether this continued during the subsequent proliferation phase. At various time points after α-GalCer treatment, mice were killed, and their liver lymphocyte populations (Fig. 5⇓) and spleen lymphocyte populations (not shown) were analyzed for the presence of either IL-4- or IFN-γ-expressing cells using intracellular cytokine staining. As shown in Fig. 5⇓, clearly detectable levels of IL-4 were being produced by αβTCRint cells at 2 h; however, this was not seen at 16 h. In contrast, high levels of IFN-γ production were observed until at least 72 h after treatment. At each time point a control mouse, injected 2 h previously with α-GalCer, was examined and consistently yielded clear IL-4 staining, similar to what is shown in Fig. 5⇓, allowing us to state with confidence that the NKT cells at later time points were producing far less IL-4 than they were at 2 h. To determine which cells were responsible for this cytokine production, cytokine-expressing cells were gated and analyzed for surface αβTCR-allophycocyanin vs intracellular αβTCR-FITC expression for time points up to 24 h. For later time points, when CD1d tetramer+ NKT cells had reappeared, cytokine-producing cells were examined for CD1d tetramer binding. Between 16 and 24 h, the main IFN-γ-producing cells correlated with the intracellular αβTCR+ population (Fig. 5⇓B), indicating that the predominant cytokine-producing cells were NKT cells. Even at 48 and 72 h, it was clear that CD1d tetramer+ cells were the main source of IFN-γ production (Fig. 5⇓C). The other IFN-γ+ cells are likely to include NK cells and other T cells, which are known to produce this cytokine in response to α-GalCer stimulation of NKT cells. Very similar results were derived from analysis of spleen lymphocytes (data not shown). NKT cells cease producing IL-4 but continue to produce IFN-γ for 3 days after stimulation. Mice were injected i.p. with 2 μg of α-GalCer or vehicle and were killed 2, 16, 24, 48, and 72 h later. Liver lymphocytes were cultured for 2 h in brefeldin A, labeled with cell surface mAb, fixed and permeabilized for intracellular cytokine labeling, and analyzed by flow cytometry. A, Lymphocytes were electronically separated from CD11b (Mac-1)+ cells and analyzed for αβTCR expression vs intracellular IL-4 or IFN-γ. Rat IgG1 was used as an intracellular isotype control. Regions were set based on background levels of the isotype control at each time point. Cytokine-positive cells were gated on and analyzed for surface αβTCR vs intracellular αβTCR (B) or surface-bound CD1d/α-GalCer tetramer (C). Cytokine+ cells are shown as black dots, superimposed over total lymphocytes as lighter gray dots. The data represent: 2 h, n = 5; 16 h, n = 6; 24 h, n = 2; 48 h, n = 6; and 72 h, n = 2 mice/group. NKT cells play a key role in many different types of immune responses (1, 2); however, NKT cell biology, particularly the response of these cells to stimulation, is very poorly understood. Current theories suggest that NKT cells rapidly respond with a burst of immunoregulatory cytokines, including IL-4 and IFN-γ, and then undergo apoptosis within hours of stimulation through AICD (11, 13, 14, 16, 27). How this can have such a dramatic and diverse impact on many different types of immune response, including IL-4-dependent immunosuppressive responses (28) and IFN-γ-dependent cell-mediated responses (9, 14, 24), is one of the key paradoxes in the field. Our results beg reinterpretation of earlier studies, indicating that glycolipid Ag-mediated stimulation of NKT cells leads to cell surface receptor down-regulation within hours of stimulation, and that most NKT cells survive this process and begin to proliferate, leading to a large, but transient, increase in the number of NKT cells in vivo, with ongoing production of IFN-γ, but not IL-4. We should emphasize that our results are not necessarily incongruous with the earlier study by Eberl et al. (15), in which NKT cell depletion and repopulation were monitored following either IL-12- or anti-CD3-mediated stimulation. These are clearly very different forms of stimulation that do not depend on CD1d+ APCs, and in the case of anti-CD3 may at least partly be due to Ab-mediated depletion. It is generally accepted that the disappearance of NKT cells is only transient, with most studies reporting the reappearance of NK1.1+ αβTCR+ cells within 2–3 days of stimulation (11, 12, 15, 20, 29). However, using these markers, previous studies had failed to detect the extensive expansion of NKT cells that occurred over the few days following stimulation. This can be explained by our observation that NK1.1 levels remained low for several days following stimulation; thus, most NKT cells were undetectable using previous methods. NK1.1 down-regulation by NKT cells had been previously observed in vitro following TCR-mediated stimulation (21), but this phenomenon had not been directly demonstrated in vivo. NK1.1−, CD1d/α-GalCer tetramer-binding, NKT cells are known to exist in vivo in normal, nonchallenged mice (16, 30, 31, 32), and at least some of these cells are probably immature NKT cells that have recently arrived from the thymus (33, 34). Given that NKT cell expansion was observed with similar kinetics in all tissues except thymus, it is unlikely that the expansion observed in this study results from thymic emigration, particularly when NKT cells were found to be blasting in situ in liver and spleen. Furthermore, earlier studies showed that restoration of NKT cell numbers following stimulation did not require an intact thymus (15, 35). Previous studies have reported that thymic NKT cells are refractory to α-GalCer stimulation even when this compound is injected intrathymically (2, 16) (our unpublished observations). This might be due to α-GalCer being presented to NKT cells by CD1d+ thymocytes rather than professional APCs. In support of this, thymic NKT cells can be stimulated in vitro with α-GalCer, but only in the presence of APCs (including DC, macrophages and B cells) (R. Keating, unpublished observations) and (33). Biologically, this might be important for positive and/or negative selection of NKT cells in the context of self-glycolipid ligands. The significance of our observation that NKT cells undergo vigorous expansion is further demonstrated by the fact that these cells continue to make IFN-γ for at least 3 days after their initial stimulation. In contrast, they produced high levels of IL-4 for only the first few hours. A major question in NKT cell biology is how the production of mutually antagonistic cytokines (IL-4 and IFN-γ) can be differentially interpreted by the immune system, particularly in different models. For example, NKT cell-mediated suppression of type 1 diabetes is IL-4 dependent (28), whereas NKT cell promotion of tumor rejection is IFN-γ dependent (9, 14, 24, 36). Our results suggest that temporal differences in cytokine production may potentially be a key to the different types of responses with which NKT cells are associated. For example, NKT cell responses requiring IL-4 production might only occur within hours of NKT cell involvement, which may limit the number and type of cells that encounter NKT cell-derived IL-4. In contrast, NKT cell responses requiring IFN-γ production may evolve over subsequent hours/days and may influence the different cell types that encounter or remain in contact with NKT cells at later stages. It should be emphasized that NKT cells are thought to primarily act as initiators of immune responses involving downstream effector cells that also produce cytokines. For example, both NKT cells and NK cells produce IFN-γ following α-GalCer stimulation, and both cells must produce this cytokine to mediate tumor rejection (24). It should also be considered that naturally occurring (and as yet undefined) NKT cell ligands, that presumably are important in some models of NKT cell activity, may induce a very different cytokine response from that reported in this study. For example, CD1-binding natural ligands of differing affinity or more persistent presence may generate quantitatively and qualitatively different cytokine responses from NKT cells. In summary, this study shows that following a single injection of α-GalCer at a dose employed by most studies using this compound, the majority of NKT cells do not die by AICD as previously thought, but evade detection by down-regulation of their receptors. α-GalCer-induced activation causes NKT cells to rapidly expand to many times their normal number before contraction several days later. Furthermore, although NKT cells clearly produce detectable levels of both IL-4 and IFN-γ within 2 h of stimulation, they switch to a Th1-like cytokine profile by 16 h, which continues until at least 3 days after antigenic challenge. These findings provide important new insight into how this normally rare population of cells has the powerful ability to regulate immune responses to cancer, infection, and autoimmunity. We thank Dr. Stuart Berzins for helpful discussions; Daniel Pellicci and Jessica Markby for technical support; Drs. Elise Randle Barrett, Paul Cameron, and Geza Paukovics for flow cytometry assistance; and Deb Ramsey and the Precinct Animal Center animal staff for animal husbandry assistance. We thank Kirin Breweries (Gunma, Japan) for providing α-GalCer. We also thank Dr. Luc van Kaer for sharing information before publication. ↵1 This work was supported by the National Health and Medical Research Council and donations from Rothschild Australia. M.S. and D.G. are supported by National Health and Medical Research Council research fellowships. M.S. and Y.H. are supported by an Human Frontiers Science Program grant. N.C., A.U., and R.K. were supported by Australian Postgraduate Awards. K.H., S.S., and M.K. were supported by National Institutes of Health Grant RO1CA52511. ↵3 Abbreviations used in this paper: AICD, activation-induced cell death; BrdU, 5-bromo-2-dexyuridine; α-GalCer, α-galactosylceramide; gld, generalized lymphoproliferative disease; WT, wild type; 7AAD, 7-amino actinomycin D.
Godfrey, D. I., K. J. Hammond, L. D. Poulton, M. J. Smyth, A. G. Baxter. 2000. NKT cells: facts, functions and fallacies. Immunol. Today 21:573. Bendelac, A., M. N. Rivera, S. H. Park, J. H. Roark. 1997. Mouse CD1-specific NK1 T cells: development, specificity, and function. Annu. Rev. Immunol. 15:535. Bendelac, A., O. Lantz, M. E. Quimby, J. W. Yewdell, J. R. Bennink, R. R. Brutkiewicz. 1995. CD1 recognition by mouse NK1+ T lymphocytes. Science 268:863. Burdin, N., L. Brossay, Y. Koezuka, S. T. Smiley, M. J. Grusby, M. Gui, M. Taniguchi, K. Hayakawa, M. Kronenberg. 1998. Selective ability of mouse CD1 to present glycolipids: α-galactosylceramide specifically stimulates Vα14+ NKT lymphocytes. J. Immunol. 161:3271. Hong, S. M., D. C. Scherer, N. Singh, S. K. Mendiratta, I. Serizawa, Y. Koezuka, L. Van Kaer. 1999. Lipid antigen presentation in the immune system: lessons learned from CD1d knockout mice. Immunol. Rev. 169:31. Kawano, T., J. Q. Cui, Y. Koezuka, I. Toura, Y. Kaneko, K. Motoki, H. Ueno, R. Nakagawa, H. Sato, E. Kondo, et al 1997. CD1d-restricted and TCR-mediated activation of Vα14 NKT cells by glycosylceramides. Science 278:1626. Hammond, K. J., D. I. Godfrey. 2002. NKT cells: potential targets for autoimmune disease therapy?. Tissue Antigens 59:353. Smyth, M. J., N. Y. Crowe, K. Takeda, H. Yagita, D. I. Godfrey. 2002. NKT cells: conductors of tumor immunity?. Curr. Opin. Immunol. 14:165. Smyth, M. J., D. I. Godfrey. 2000. NKT cells and tumor immunity–a double-edged sword. Nat. Immunol. 1:459. Nakagawa, R., I. Nagafune, Y. Tazunoki, H. Ehara, H. Tomura, R. Iijima, K. Motoki, M. Kamishohara, S. Seki. 2001. Mechanisms of the antimetastatic effect in the liver and of the hepatocyte injury induced by α-galactosylceramide in mice. J. Immunol. 166:6578. Osman, Y., T. Kawamura, T. Naito, K. Takeda, L. Van Kaer, K. Okumura, T. Abo. 2000. Activation of hepatic NKT cells and subsequent liver injury following administration of α-galactosylceramide. Eur. J. Immunol. 30:1919. Leite-de-Moraes, M. C., A. Herbelin, C. Gouarin, Y. Koezuka, E. Schneider, M. Dy. 2000. Fas/Fas ligand interactions promote activation-induced cell death of NK T lymphocytes. J. Immunol. 165:4367. Hayakawa, Y., K. Takeda, H. Yagita, S. Kakuta, Y. Iwakura, L. Van Kaer, I. Saiki, K. Okumura. 2001. Critical contribution of IFN-γ and NK cells, but not perforin-mediated cytotoxicity, to anti-metastatic effect of α-galactosylceramide. Eur. J. Immunol. 31:1720. Eberl, G., H. R. Macdonald. 1998. 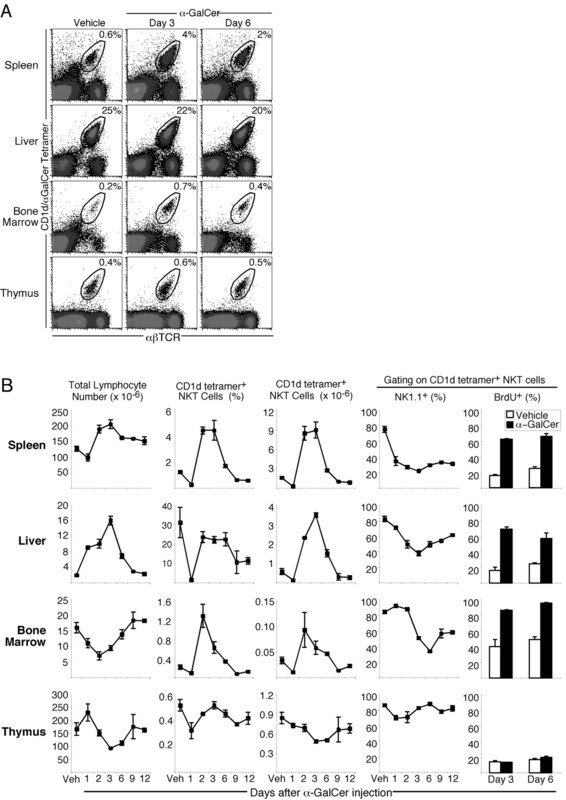 Rapid death and regeneration of NKT cells in anti-CD3-ε- or IL-12-treated mice: a major role for bone marrow in NKT cell homeostasis. Immunity 9:345. Matsuda, J. L., O. V. Naidenko, L. Gapin, T. Nakayama, M. Taniguchi, C. R. Wang, Y. Koezuka, M. Kronenberg. 2000. Tracking the response of natural killer T cells to a glycolipid antigen using CD1d tetramers. J. Exp. Med. 192:741. Brossay, L., M. Chioda, N. Burdin, Y. Koezuka, G. Casorati, P. Dellabona, M. Kronenberg. 1998. Cd1d-mediated recognition of an α-galactosylceramide by natural killer t cells is highly conserved through mammalian evolution. J. Exp. Med. 188:1521. Sidobre, S., O. V. Naidenko, B. C. Sim, N. R. Gascoigne, K. C. Garcia, M. Kronenberg. 2002. The Vα14 NKT cell TCR exhibits high-affinity binding to a glycolipid/CD1d complex. J. Immunol. 169:1340. Eberl, G., P. Brawand, H. R. MacDonald. 2000. Selective bystander proliferation of memory CD4+ and CD8+ T cells upon NK T or T cell activation. J. Immunol. 165:4305. Fujii, S., K. Shimizu, M. Kronenberg, R. M. Steinman. 2002. Prolonged IFN-γ-producing NKT response induced with α-galactosylceramide-loaded DCs. Nat. Immunol. 3:867. Chen, H. J., H. Huang, W. E. Paul. 1997. NK1.1+CD4+ T cells lose NK1.1 expression upon in vitro activation. J. Immunol. 158:5112. Korner, H., D. S. Riminton, D. H. Strickland, F. A. Lemckert, J. D. Pollard, J. D. Sedgwick. 1997. Critical points of tumor necrosis factor action in central nervous system autoimmune inflammation defined by gene targeting. J. Exp. Med. 186:1585. Korner, H., E. Cretney, P. Wilhelm, J. M. Kelly, M. Rollinghoff, J. D. Sedgwick, M. J. Smyth. 2000. Tumor necrosis factor sustains the generalized lymphoproliferative disorder (gld) phenotype. J. Exp. Med. 191:89. Smyth, M. J., N. Y. Crowe, D. G. Pellicci, K. Kyparissoudis, J. M. Kelly, K. Takeda, H. Yagita, D. I. Godfrey. 2002. Sequential production of interferon-γ by NK1.1+ T cells and natural killer cells is essential for the antimetastatic effect of α-galactosylceramide. Blood 99:1259. Tough, D. F., J. Sprent. 1994. 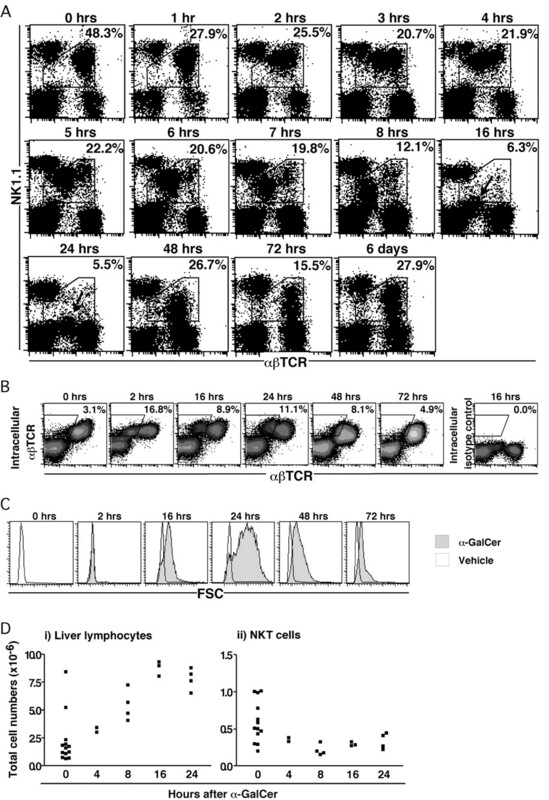 Turnover of naive- and memory-phenotype T cells. J. Exp. Med. 179:1127. Hildeman, D. A., Y. Zhu, T. C. Mitchell, P. Bouillet, A. Strasser, J. Kappler, P. Marrack. 2002. Activated T cell death in vivo mediated by proapoptotic bcl-2 family member bim. Immunity 16:759. Osman, Y., T. Watanabe, Y. Kawachi, K. Sato, K. Ohtsuka, H. Watanabe, S. Hashimoto, Y. Moriyama, A. Shibata, T. Abo. 1995. Intermediate tcr cells with self-reactive clones are effector cells which induce syngeneic graft-versus-host disease in mice. Cell. Immunol. 166:172. Hammond, K. J. L., L. D. Poulton, L. J. Palmisano, P. A. Silveira, D. I. Godfrey, A. G. Baxter. 1998. α/β-T cell receptor (TCR)+ CD4−CD8− (NKT) thymocytes prevent insulin-dependent diabetes mellitus in nonobese diabetic (NOD/Lt) mice by the influence of interleukin (IL)-4 and/or IL-10. J. Exp. Med. 187:1047. Eberl, G., H. R. MacDonald. 2000. Selective induction of NK cell proliferation and cytotoxicity by activated NKT cells. Eur. J. Immunol. 30:985. Hameg, A., I. Apostolou, M. Leite de Moraes, J. M. Gombert, C. Garcia, Y. Koezuka, J. F. Bach, A. Herbelin. 2000. A subset of NKT cells that lacks the NK1.1 marker, expresses CD1d molecules, and autopresents the α-galactosylceramide antigen. J. Immunol. 165:4917. Kameyama, H., T. Kawamura, T. Naito, M. Bannai, K. Shimamura, K. Hatakeyama, T. Abo. 2001. Size of the population of CD4+ natural killer T cells in the liver is maintained without supply by the thymus during adult life. Immunology 104:135. Crowe, N. Y., M. J. Smyth, D. I. Godfrey. 2002. A critical role for natural killer T cells in immunosurveillance of methylcholanthrene-induced sarcomas. J. Exp. Med. 196:119.